The scotch bonnet is the pepper of choice in the Caribbean—it's the most widely used hot pepper in the region's cuisine. Other hot peppers, such as cherry peppers (wiri wiri), bird peppers, habanero, and pimento peppers are also readily available and used in various recipes, and Indian chili peppers can also be found in markets and supermarkets. But when someone talks about hot peppers in the Caribbean, particularly in the English-speaking Caribbean, they're almost certainly referring to the scotch bonnet pepper. You might see them labeled in stores and markets as "hot peppers" or "big peppers." Scotch bonnets got their name because of their appearance. They grow in an odd, flattened shape that resembles a tam or "Scotsman's bonnet." Depending on what area of the Caribbean you're visiting, these peppers may also be called "Bahama mamas" or "Jamaican hots." The bonnet connection can be a little off with some species of this pepper because they grow longer with less of a squashed appearance in some regions. What Does the Scotch Bonnet Taste Like? Scotch bonnets are hot peppers—very hot—but they can have an almost sweet, vaguely fruity taste underlying the spice. This can vary somewhat from region to region, however, because it depends on the soil conditions to an extent in which they're grown. 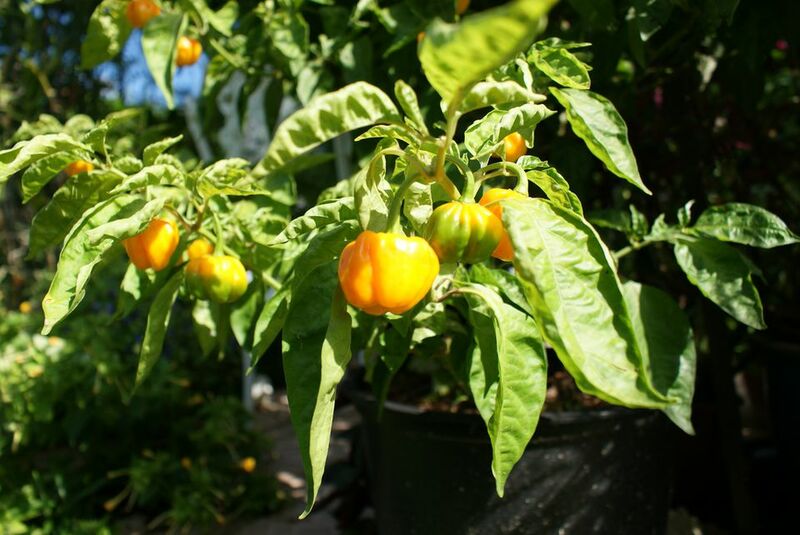 Scotch bonnet peppers are used to make the famous Caribbean or West Indian pepper sauces. Pepper sauce is traditionally used as a condiment, as well as to season meat, fish, and poultry. The scotch bonnet is also used whole to impart flavor without the full impact of its heat. In some preparations, it's simply chopped or minced and added to the food in the early stages of cooking. The scotch bonnet is one of the hottest peppers out there, ranking side-by-side with the habanero on the heat scale. In fact, it's a close relative of the habanero. It's considered spicier than the comparatively mild jalapeno. This is especially the case if you purchase them in areas of the U.S. with high Caribbean populations who like their dishes hot. You can reduce a lot of the heat from any pepper by removing its seeds, as well as the membrane found inside the pepper—this is where most of the heat is stored. The more finely pepper is chopped or minced, the more heat is spread in the dish. And take care when you're chopping that pepper. Consider wearing cooking gloves. You'll definitely feel the effects of the pepper when it comes in contact with your skin. It's unlikely you'll find scotch bonnets in your local produce market or grocery store unless you happen to live in an area with a significant Latin American population. You might find scotch bonnet sauce, however. If you're intent on getting your hands on the genuine pepper for a recipe you've been dying to try, look for an online vendor or try growing them yourself. Seeds and plants are also available online.